As trivial as this may sound; the one thing Canadians universally snickered about was weak American beer. I’m not referring to craft beer – I’m talking blue collar, mass produced everyday beer. Years before the micro/craft brew market exploded, Canada drank beer that made American suds laughable. 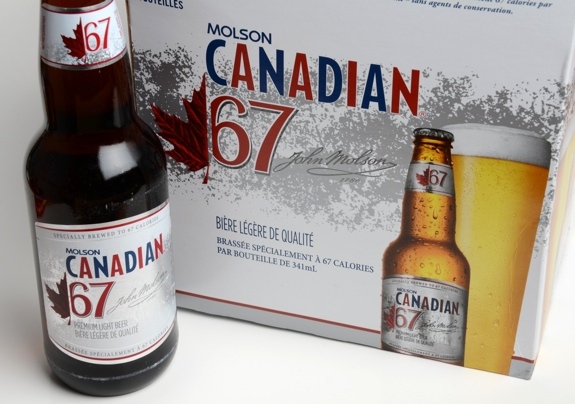 All the slick marketing, merchandise, Super Bowl commercials in the world couldn’t hide the fact – it was weak, tasteless, and inferior to Canadian brews. I admit, my first experience buying beer in America made me feel like a kid in a candy store. The novelty of liquor displayed in grocery stores at a fraction of Canadian prices was blinding. Young and stretching every penny it seemed a dream come true. At home liquor was only sold in government stores; never open on Sunday, closing at 6 PM except for Friday nights when 9 PM gave us a few extra hours to plan the weekend. As inexpensive as that beer was we just couldn’t drink it. The other day I was given a case of Canadian 67. I vaguely remembered a television ad for it; four guys drinking and laughing it up – pleased because it only had 67 calories. Taking a closer look when I got home, I realized why. It was a mere 3% alcohol. I cracked one and nearly gagged. This couldn’t possibly be Canadian beer. Worse than any dishwater American beer, it tasted like the inside of an old drain pipe. I’m begging you Canada. Have some self respect and stop calling this beer – it’s embarrassing. We’ve come a long way; liquor is available until 11 PM – even on Sundays. Beer parlors are now brew pubs offering up to 30 choices on tap. Beer is an integral part of Canadian culture; call this travesty beer and we’ll be the ones snickered at.